Our little Ford Altima, at 18 years old, occasionally has some mechanical issues. But imagine my surprise when the person who came out to tow her to the shop was a darling lady named Rose from Wylie. Single handedly, she backed her big rig down my driveway, hoisted the car up onto the tilting bed and cranked it all onto the tow truck. You know how inspiring a competent woman is, especially in a traditionally male profession. And anyone who can back a huge truck down a narrow path has my admiration. Turns out, Rose also keeps Boer goats and guard dogs - we had a lot to talk about. And THEN, she pulls out her gorgeous in-progress crochet project - a pineapple pattern table cloth, almost finished. 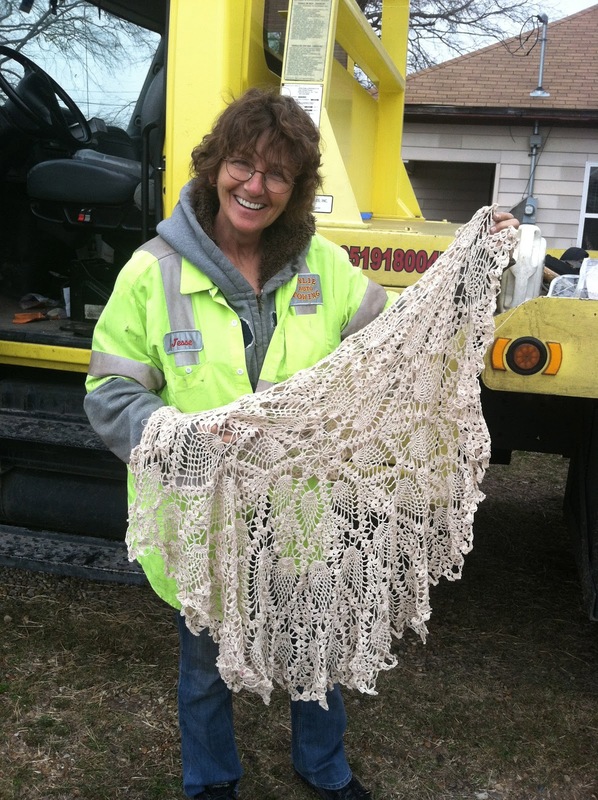 Anyone who keeps her crocheting on the seat of her truck everywhere she goes is definitely One Of Us. We swapped business cards and I really hope we see Rose back here at the barn for some awesome stitchin' time together! Can't wait to meet her--she sounds like our kinda folk! That is tooo cool! Great to meet "kindred spirits" in the strangest places. Thanks for sharing. That woman is enough to inspire a new Helen Redding song! What a beautiful collection of talents! Wow! What a beautiful piece of crochet! I am in awe!